Notes: PRR Class K-4S; Altoona, PA. Description: Here is page two of a 15-page article by Bert Pennypacker entitled "Soliloquy Of Altoona." 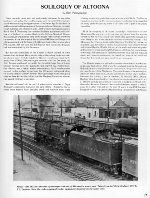 It was published originally in the April 1978 issue of "Rails Northeast" magazine, page 17. Partial Caption: "K-4s #3872 accelerates a passenger train out of Altoona for points east." Shown here is Pennsylvania Railroad engine #3872, a K-4S (4-6-2) "Pacific" built in Juniata during 1923 and retired in April of 1958. Photo by F.S. Gamber; taken from the 9th Street Bridge.